We provide degrees that give you the tools you need to fulfill your God-given purpose. • 100% of our first-time freshmen have received grants or scholarships directly from Grace for the past two years running. • 86% of students are employed within six months of graduation. • Grace Christian University students graduate with an average of 15% less student debt than the national average. • 100% of students say that professors are engaging and easy to understand. • 91% of students say that their professors work hard for their classes and care about their students. Grace Christian University is a thriving biblical university located 10 minutes south of downtown Grand Rapids, Michigan. At Grace, we pride ourselves on providing students with a biblical worldview and an education that is infused with experiential learning opportunities. Our institution was founded over 80 years ago and has continued to be committed to the goal of providing students with the tools they need to fulfill their God-given purpose. 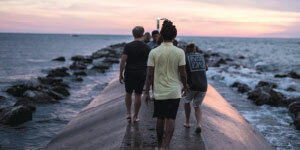 As a non-denominational institution, Grace welcomes Christian students from many walks of life. 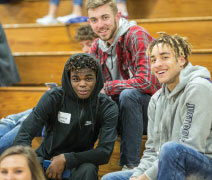 Despite our diversity, students constantly comment on the relationships they build during their time at Grace—solid, lifelong relationships. It’s not just relationships between students though. In fact, many students develop lasting relationships with professors who make themselves available beyond the classroom. It’s a truly unique opportunity to be shaped into the man or woman that God has designed you to be. Grace was founded as a Bible institute before becoming a Bible college. Just this past summer, the school transitioned into being Grace Christian University. As a result, the Bible is ingrained in every aspect of what we do. All students will complete a minimum of 30 credits in Bible and theology courses while also learning how God’s word informs issues related to their major. Our students have numerous opportunities to serve God in various ways. Students have traveled internationally, served in local churches, and participated in countless ministries throughout the surrounding area. Ministry is built into the fabric of who we are! In fact, each week students are required to log a minimum of two hours of ministry service. This way, students get deepened exposure to the world they will be sent out to serve after graduation. It also provides opportunities to put their growing knowledge and skills into practice. What makes Grand Rapids great? Our city is home to some of the best food and coffee on the planet. But don’t just take our word for it. The World Food Travel Association ranked Grand Rapids as the second-best food and beverage destination worldwide. 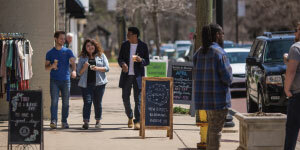 When our students have been fed and properly caffeinated, they enjoy the growing arts scene, music venues, and cultural enrichment opportunities in Grand Rapids. Needless to say, there is no shortage of things to do here!